Sleep Changes as We Age. So What Does That Mean? As we age, most every aspect of life changes. Our sleep is no different. Our sleep patterns actually change throughout our lives, with our sleep needs gradually decreasing as we age. You probably know, for example, that newborns sleep for the majority of the day. By the time kids are toddlers, they likely only need between 11 and 12 hours of sleep per 24-hour period, much less than a newborn. That pattern of slowly decreasing sleep needs continues until we reach middle age, when our needs level out to between seven and nine hours of sleep. While that need remains the same for older adults, it can be much more difficult for seniors to get the quality sleep they need. That occurs for a variety of reasons, including the fact that sleep disorders are more common among seniors. In addition, seniors often take at least several medications, and many medications can cause issues with falling or staying asleep. At Senior LIFE, we specialize in helping seniors and their caregivers manage the unique needs and challenges that are part of growing older. Sleep changes are one such challenge. Let’s take a look at three key ways sleep changes as we age—and how Senior LIFE can help you handle those changes. Ready to Start Sleeping a Little Easier? Senior LIFE may be an option for you or your loved one. 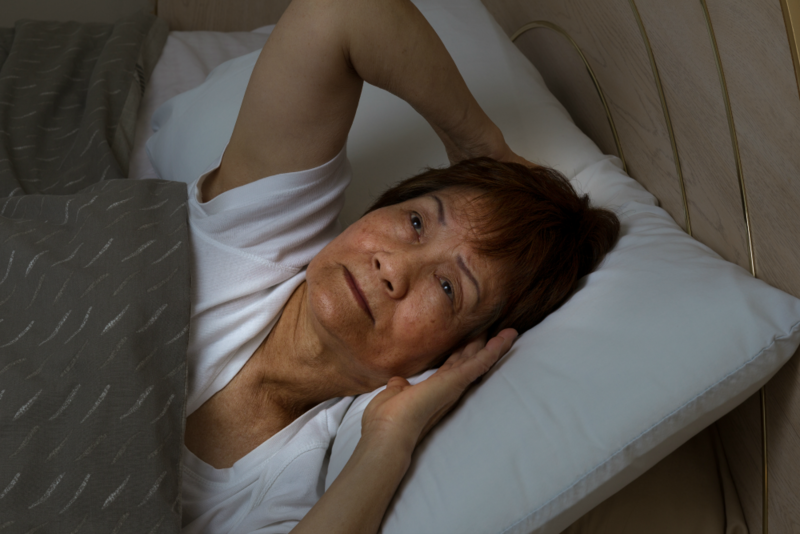 While many people have difficulty falling asleep throughout life, the problem—called insomnia—is more common among seniors. In fact, according to the National Sleep Foundation, more than 40 percent of older adults have insomnia at least a few nights each week. The causes of insomnia vary. In many cases, an underlying physical or mental health condition may lead to an inability to fall asleep or stay asleep. Certain medications can also cause insomnia. If you or a loved one have difficulty falling asleep, there are steps you can to try and find relief. A medical checkup is a good first step. Your doctor can evaluate your overall health to determine if a health condition is to blame. If the insomnia doesn’t seem to have an underlying cause, your doctor may recommend lifestyle changes like cutting back on caffeine and other nutritional changes, avoiding napping during the daytime, and changing your bedtime habits. Did you know that there are two distinct types of sleep? Sleep is divided into two categories—rapid eye movement sleep, called REM, and non-rapid eye movement sleep, called NREM. NREM sleep is the calmer portion of sleep, while REM sleep is the period where your body and brain are more energized. During this type of sleep, dreams occur. Researchers think that REM is also the part of sleep where your mind is processing memories and learning. This type of sleep typically makes up 25 percent of a person’s total sleep for the night. For many seniors, though, that percentage drops, meaning they’re spending less time in the period devoted to active brain movement. How does this affect health? Researchers still aren’t quite sure, but some studies have linked a reduction in REM sleep with an increased risk of dementia. Seniors also experience more fragmented sleep, meaning they wake more often during the night. This is usually caused by some type of sleep disruption. The National Sleep Foundation reports that snoring is the primary cause behind sleep disruption for around 90 million Americans. Because snoring often worsens as we age, it can be a particular problem for seniors. And snoring is more than just annoying. Loud snoring can be a sign of sleep apnea, which can increase a person’s risk of developing heart disease, headaches, and depression, among other medical conditions. Another sleep disorder, restless legs syndrome, is also a common sleep disruption among seniors. RLS causes unpleasant tingling or creeping feelings in the legs, which worsen at night. These sensations can make it difficult to remain asleep. Other health conditions, like acid reflux or allergies, can also make sleeping through the night more difficult. A doctor can help determine if these conditions are disrupting sleep and offer treatment options to help with the problem. For members of Senior LIFE, all aspects of health are taken care of through the program. After joining, members receive an individualized care plan that may include services such as rehabilitation and in-home care. Find out if you’re eligible.